[Episcopal News Service] Sometimes outreach can take on a life of its own. That’s the case at St. John’s Episcopal Cathedral in Knoxville, Tennessee, where the congregation’s decade of support for the local YWCA sprouted a dental care ministry that has grown into a nonprofit organization with a model that leaders hope can be replicated around the country. Smiles for Hope started with the idea that dental care was nearly as important as medical care for people living on the economic margins. In a little over two years, the ministry has provided an estimated $200,000 in pro bono dental work, from routine cleanings to tooth extractions and dentures, to the women living in transitional housing at YWCA Knoxville. And although those dental services have expanded well beyond the outreach that initially was supported by St. John’s, a spiritual mission still inspires Smiles for Hope’s volunteers. “I’m convinced that this is something that is meant to be,” said Dr. Smita Borole, the dentist who now is the driving force behind the Smiles for Hope nonprofit. Borole is from India, where she was raised in the Hindu faith but also attended a Catholic school, and she feels a higher power guiding her work with Thiel and the YWCA. “The mission is so important, and the difference that we’re making in people’s lives, it is so impactful,” Borole told Episcopal News Service. St. John’s connection to the YWCA began through a group of lay members that call themselves St. John’s Friends. The group began by offering dinners for the women living at the YWCA, and over the years members of the congregation have led Christmas craft projects, donated movie passes and gift cards to the women and worked to provide items from wish lists created by the YWCA. The YWCA’s 58-bed facility opened in 1925, and since then it has offered transitional housing for women struggling with a variety of challenges, such as homelessness, the threat of eviction and domestic violence. The demand is great, and the YWCA’s waiting list for rooms is long, Parrott said. St. John’s offers a grant program to help the women pay part of their $140 move-in fees. Residents must have some form of income and can stay up to two years in the single-occupancy rooms, with the average stay being a little more than a year. “The goal is to get them into something more permanent,” Parrott said. YWCA officials gather the women once a month for meetings that provide guidance, support and connections to other services. And at each meeting, the women are offered dental screenings and invited to make appointments with Smiles for Hope. The dental care ministry had been underway for a few years, at Thiel’s instigation, before it became known as Smiles for Hope. Thiel, now 77, previously worked as a dental assistant, and after retiring about 10 years ago she began looking for volunteer opportunities. At the same time, she was wrapping up participation in the Education for Ministry program and scanning the church bulletin when she spotted an opening for a volunteer dental assistant at Knoxville’s Volunteer Ministry Center, which supports people who are homeless. “It was kind of like, OK, well, I guess that’s God saying I need to do something about this,” she said. The Volunteer Ministry Center was developing a new headquarters to include a three-chair dental clinic to serve the chronically homeless, and when that was up and running, Thiel signed on to help. But she also thought of the women staying at the YWCA, who wouldn’t qualify for the Volunteer Ministry Center’s services but still would benefit from free dental care. Thiel said she approached the dentist who was working with the center and asked if he’d be open to treating the YWCA residents on one Saturday a month, when the dental clinic otherwise wouldn’t be in use. He agreed to help, and a new ministry was born. After a few years of that work, the clinic received a fortuitous visit from another dentist who was interested in volunteering. That dentist was Borole, and as she joined the team, she took on more of a leadership role. Under Borole, the ministry incorporated as the Smiles for Hope nonprofit in October 2017 and continues to schedule appointments once a month. Borole attends the YWCA’s meeting with its residents on the first Wednesday of every month and schedules women for appointments over four hours on the following Saturday. 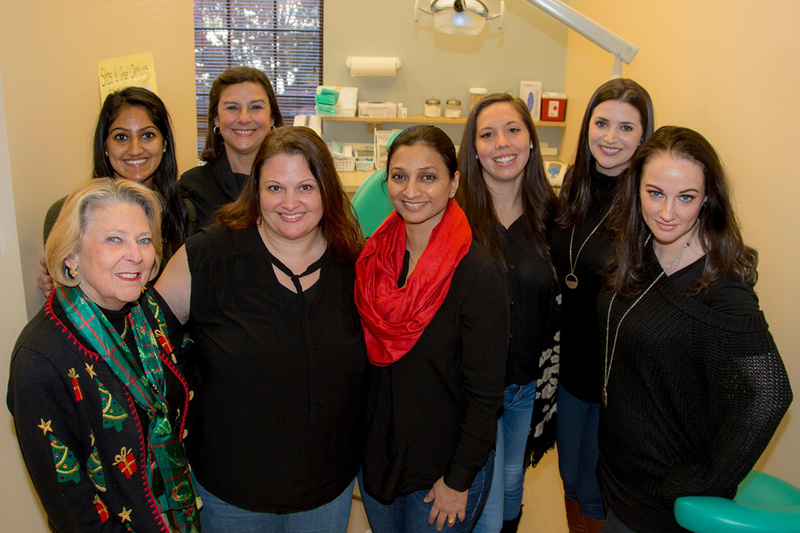 The Smiles for Hope clinic typically serves a dozen or more women each month, and Borole and Thiel are supported by several other volunteers, such as hygienists, dental assistants, a lab technician and people who handle paperwork and the intake process. Some patients receive root canals, fillings or crowns. Dental cleanings are common, but Borole’s team also often handles more intensive procedures, such as removing multiple teeth at a time to outfit the women with dentures. Many of the patients have had little to no dental care in the past, either because of the expense or lack of an opportunity to see a dentist, Borole said, so their teeth are decaying or already missing. The goal is to get as much dental work done at once, so the women don’t have to keep coming back for follow-up visits. “They’re leaving that day with a smile,” Borole said. She said she approaches each patient in a gentle manner, because dentistry’s intimacy sometimes can be intimidating. It may be uncomfortable to let a stranger into your personal space, especially for women who have been physically and emotionally abused. The results, however, can be transformative. Borole said she sometimes bumps into former patients in public and is encouraged by their boosted self-esteem and their successes, whether it be securing permanent housing or finding a job interacting with customers without feeling self-conscious about their teeth. “We’ve really gotten to know these women personally, and it really is touching,” she said. Thiel continues to help at the clinics every month, though her role has evolved into something of a general coordinator. Borole sees Thiel as sort of the glue that holds the ministry together, its tireless cheerleader. Thiel said she is happy simply directing traffic when things get hectic on a Saturday morning. Her years of experience with this work are a key asset. Thiel and Borole also hope to create a template for other organizations interested in offering free dental care in their own communities, and Smiles for Hope is looking for ways to expand within the Knoxville community as well, such as by working with domestic abuse shelters. “Our goal is to be able to help as many women and children as we possibly can,” Borole said. This is absolutely wonderful! And all because people cared and did not expect or wait on government aid. My mother would have benefitted from this caring group. Blessings on all of you. Simply outstanding. Ministry happens when you put skills together with big hearts and seek to serve others as Jesus showed us and instructed us to do. Being a dentist and priest, I am grateful, proud and inspired by your ministry. Thank you for doing this story. Dr. Borole, her staff, Pattie Thiele and Friends of St. John’s deserve the recognition.